This year, I am psyched up about having joined several sew-a-longs and block-of-the-month online programs. I have stayed on top of things so far, but it is still just February. I wonder if I have the staying power to complete all of them? Hmm.. I am certainly going to try. It will probably get a little more difficult in the warmer months when I don't want a warm quilt on my ready warm lap or want to spend more time outdoors than in. Maybe I will just have to take the sewing machine outside when it gets warmer! Welcome to the North Pole with Val Spiers has become a revived SAL with several new participants - I being one of them. I really didn't know what I was getting into when I joined this program; I thought it was be easy cheesy. Boy, was I wrong! 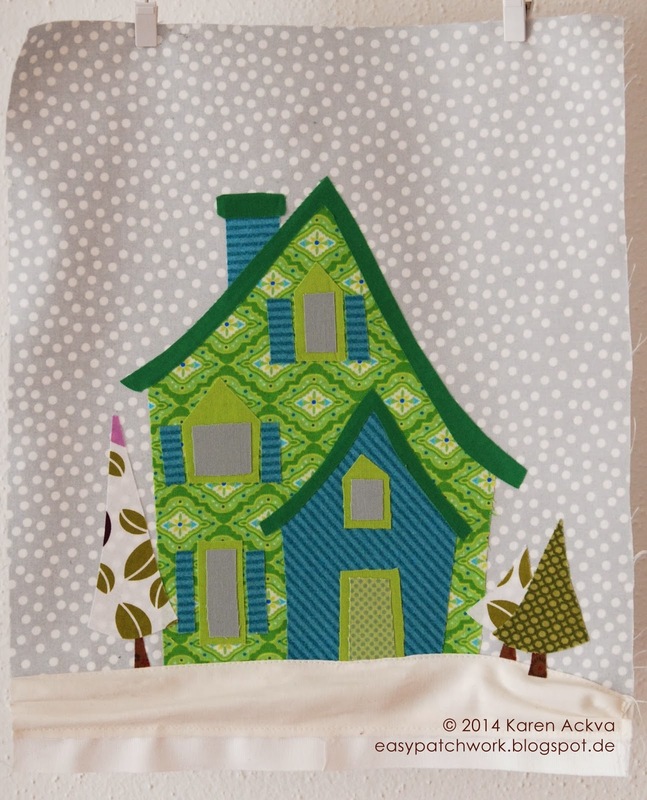 I spent all morning trying to get my fabrics right on the first block - Mr. and Mrs. Claus' House. I really loved the green fabric for the main house, and cut a smaller entrance way in green as well, but it didn't stand out the way I wanted it too. I returned back to the blue and added the blue shutters. The chimney was also an afterthought or change of fabric; it was first in browns. I might change the front door to brown?! I am not going to appliqué until I have a few more blocks finished. I want to see more of a collection of blocks before I make an impromptu decision and change things later. With the snow on the bottom, I went with the idea of cutting three inch wide strips, folding in half and sewing along the edge of the block. I made some ripples and sewed very close to the edge below the house and hill. I like the 3-D appearance of snow and drifts. I could add more stitching to the snow later. We'll see. So far, I am quite content. I could really envision hand stitching lots of details.....this is a very exciting journey for me. I am feeling much better about it today than when I made the block. I am now looking forward to the next block and have already picked the color scheme for it. One thing I have to remind myself about BOMs or SALs in that I shouldn't put too much weight on one individual block. In the end, it will be a collection of blocks. The overall impression is more important. Better said than done sometimes, right? I also like to hang the block up and live with it for a while. I am curious to seeing what the other lovely ladies have done on their North Pole blocks! Keep sewing and thanks for dropping by. When I first started to sew, it took me a while to understand some really basic acronyms in the quilting world. Granted most of these I learned online. I think the very first acronym I learned was FQ which is rather simple - a fat quarter. But over time, there have been a few more that challenged me. 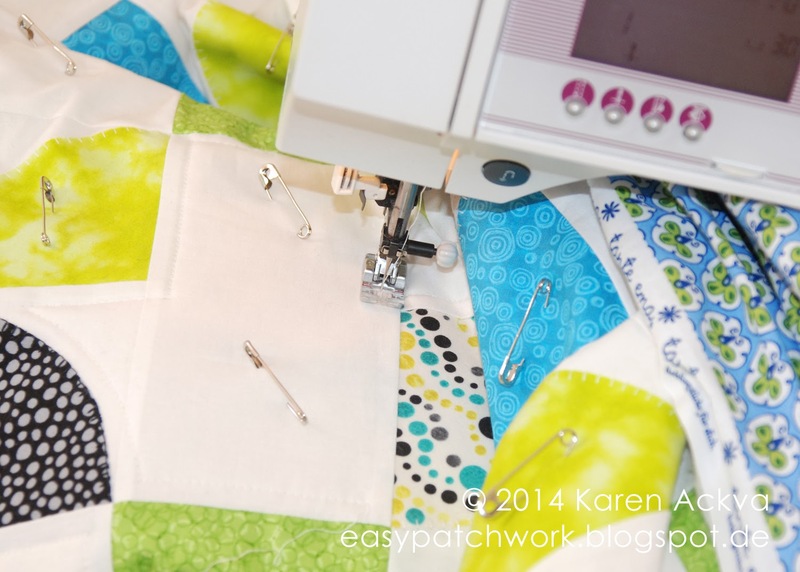 Have you ever heard of a QIP or FMQ or the fairly new FO? Are you sometimes lost too? Here is an alphabetized list of some of the acronyms and terminology of our shared language. Please feel free to add more to the bottom of the list in the comments! anything that has layers and has been made by you!